Disclosure: This Instant Pot Brats with Peppers recipe has been sponsored by Martin’s Famous Potato Rolls and Bread. All opinions are my own. Instant Pot Brats with Peppers are the best tasting brats I have ever had and will be the hit of your game day party! 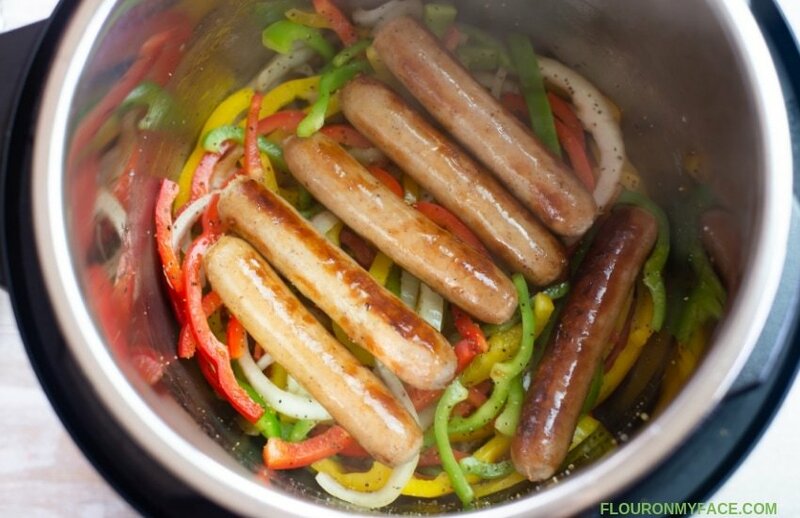 When you pressure cook brats in the Instant Pot, the Brats turn out moist and tender infused with the delicious flavors of sweet peppers and sweet onions. Martin’s Famous Potato Rolls and Bread have been our family’s favorite potato bread brand for as long as I can remember. 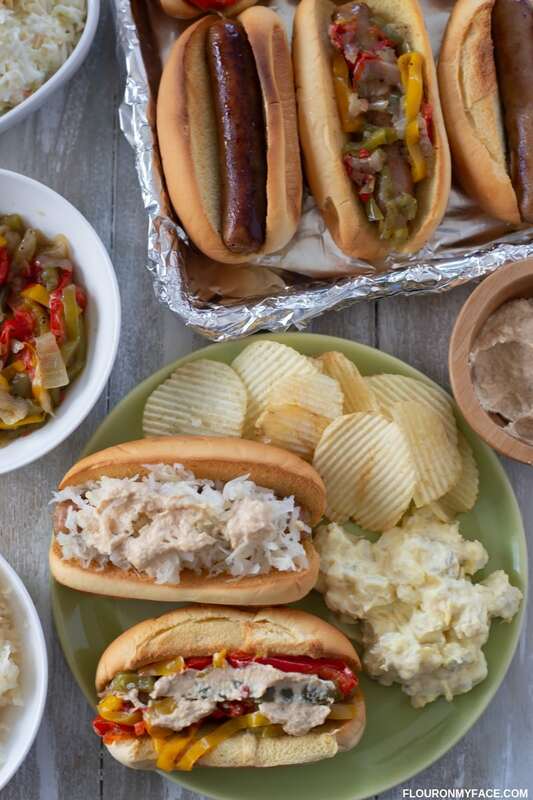 We love the sliced potato bread, slider buns and long potato rolls that are perfect for serving brats, sausage, and hot dogs. The flavor of potato bread goes perfectly with all of your favorite recipes. 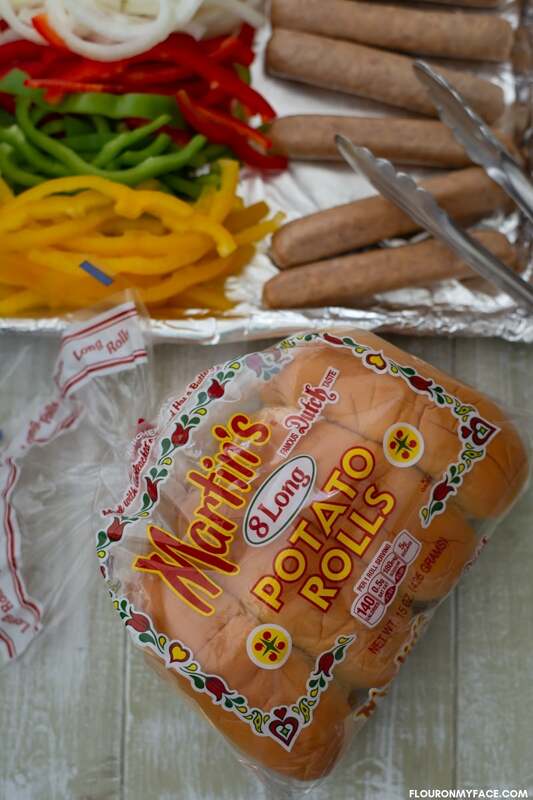 The Martin’s Famous Long Potato Rolls are the perfect roll size for Instant Pot Brats topped with peppers and onions. I am so excited to be a part of Martin’s Multi Pot vs Air Fryer battle. I will be on Team Instant Pot and my Instant Pot Brats with peppers recipe will battle against a Team Air Fryer recipe. You’ll be able to vote up your favorite recipe beginning January 11th. The winning team will be announced on the day after the big game! I can’t wait to see the Air Fryer recipe that will be featured along with my Instant Pot Brats with Peppers recipe. 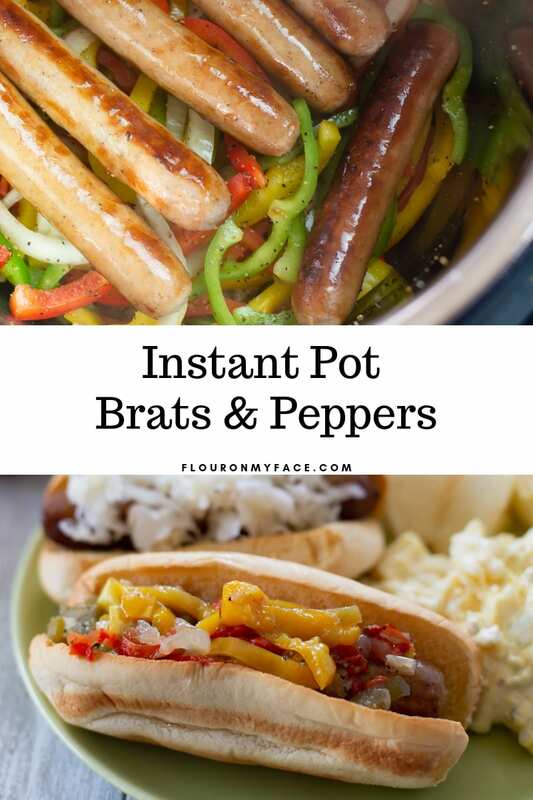 Be a pal and head over to Martin’s Multi Pot vs Air Fryer page and vote for my Instant Pot Brats and Peppers recipe. How Long to Cook Brats in the Instant Pot? The Instant Pot is the perfect way to cook Brats for your game day party. The magical Instant Pot cooks brats with peppers and onions in only 5 minutes. Instant Pot Brats with Peppers are moist and tender when cooked in the Instant Pot. If you double the Instant Pot Brats and Peppers recipe you do not need to double the amount of water used. Toasting the buns is optional but tastes so good and if you are serving the Instant Pot Brats to a crowd will keep the potato roll buns from getting extremely soggy for the peppers and onions. 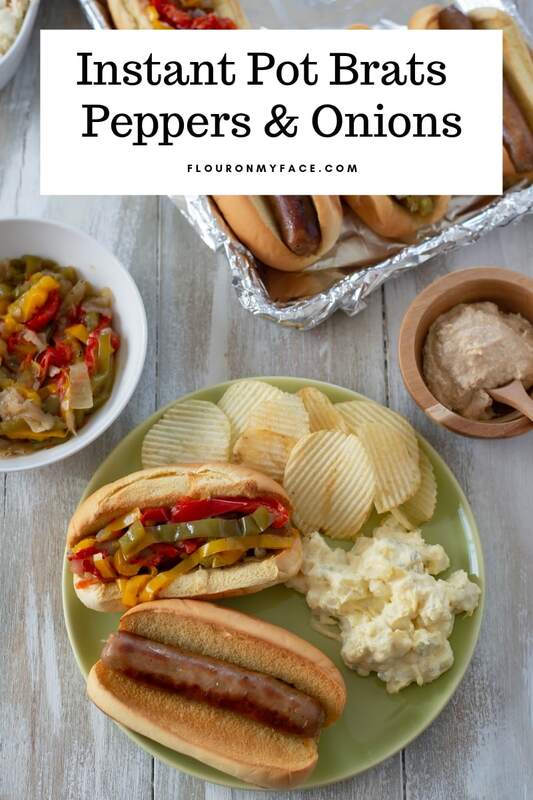 To cut out some prep time in the kitchen before your game day party slice the peppers and onions the night before and store in airtight containers in the refrigerator until needed. Best Way To Cook Brats? After making this recipe I am going to tell you the best way to cook Brats is in the Instant Pot. I have eaten many grilled brats over the years and they never tasted as good as these Instant Pot Brats with Peppers served on a Martin’s Famous Long Potato Roll. The Instant Pot Brats turned out moist and tender. Any time I’ve eaten grilled brats they always seem to be tough and dry. Turn the Instant Pot onto the high saute setting and melt the butter. Brown the Brats on all sides in the melted butter and remove to a bowl. Add the sliced bell peppers, sliced onion, salt, and ground pepper to the Instant Pot and saute for about 3 minutes. Push the warming/cancel button to turn off the saute setting. Return the brats to the Instant Pot. Add the water to the Instant Pot. Place the lid on the Instant Pot and set the valve to the sealing position. Push the manual button and set the time for 5 minutes. Allow the Instant Pot to pressure cook the brats, bell peppers, and onions for the allotted time. When the timer goes off allow the Instant Pot to naturally release the steam for 5 minutes. After 5 minutes carefully push the valve to the releasing setting with the end of a wooden spoon. Allow the steam to release. 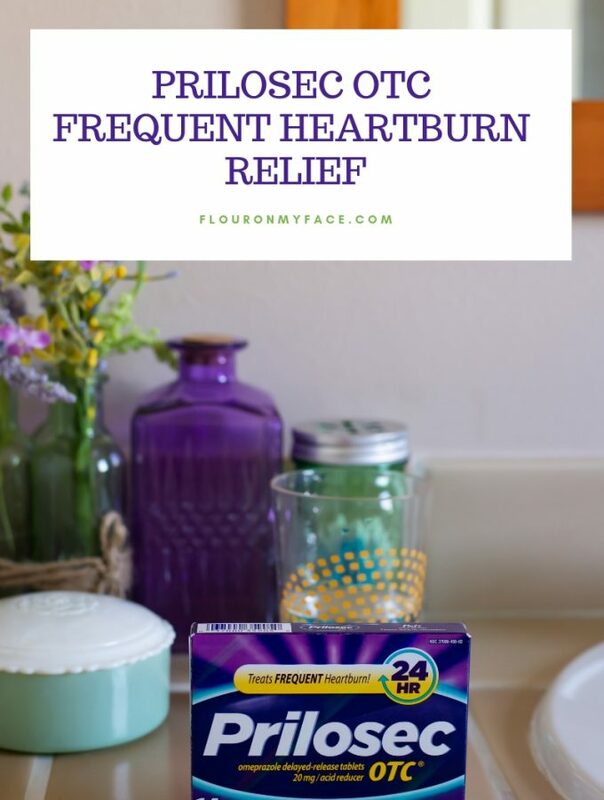 Carefully open the lid to the Instant Pot away from your face. Serve the Brats on toasted Martin’s Famous Long Potato Rolls and top with peppers and onions. Serve some of your favorite side salads like potato salad, coleslaw, and chips with the Brats. What To Serve with Brats? 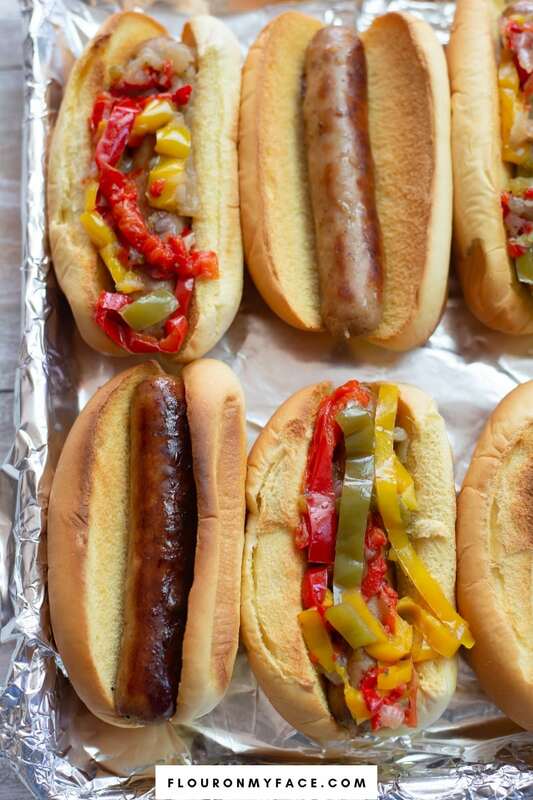 My favorite way to serve brats is with sliced peppers and onions. Or you could make Instant Pot Brats with Sauerkraut if you like a tender sausage topped with sauerkraut instead of peppers and onions. When hosting a game day party, I like to serve a few side salads along with brats. Our favorite side salads are homemade potato salad and homemade coleslaw. 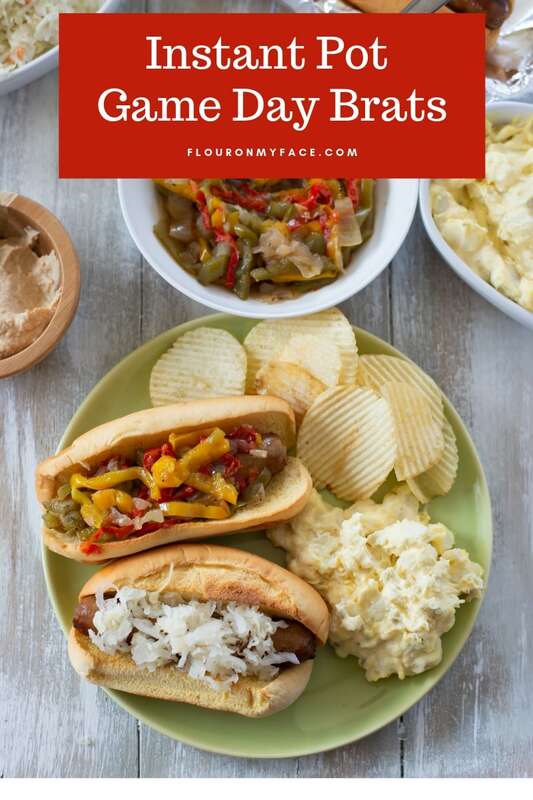 Chips are a great party food and go well served alongside these Instant Pot Brats and Peppers during your game day party. Instant Pot Brats and Peppers are moist and tender. 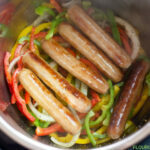 Pressure cooking Brats are the best way to make a bratwurst with peppers that is moist and tender. Makes 6 servings and can be doubled if feeding a crowd. This looks like a winner of a recipe. I know it would be a crowd pleaser for sure. What a great way to feed all your friends as they watch the game. Make lots, I know the guys will eat more than one. Love the potato buns!! Yum!! This will be a huge hit at out house, game day or not 🙂 And I’m loving the idea of a Multi Pot vs Air Fryer battle. Sounds fun. And delicious! 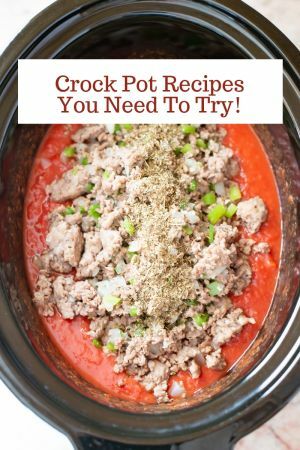 We love sausage and peppers but I have never made it in the Instant Pot so can’t wait to give it a try. 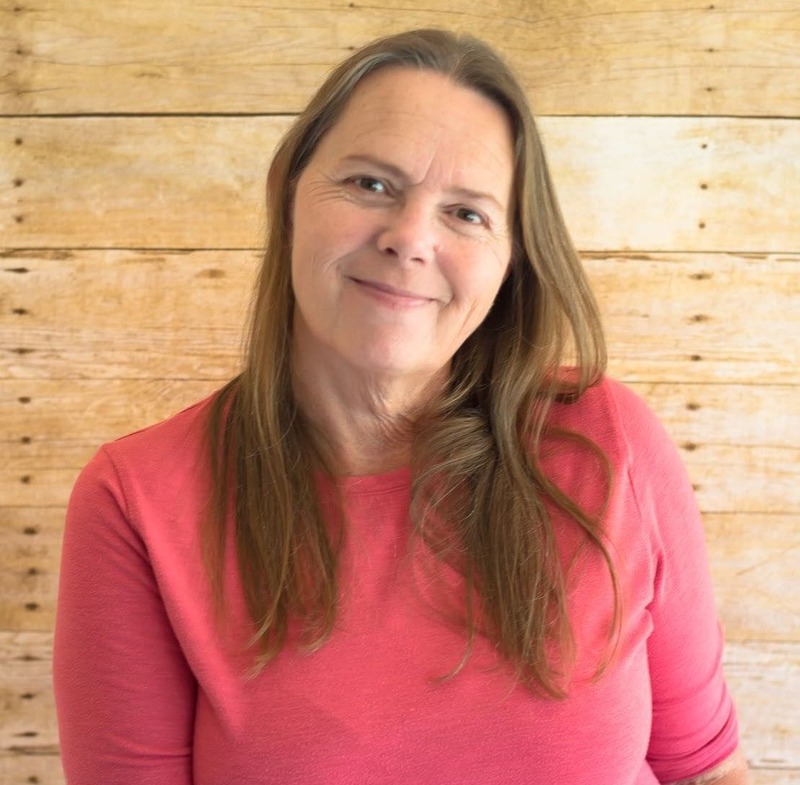 I already voted for the Instant Pot but I also have an Air Fryer so see some cool recipes to try at Martin’s voting page. Great post! This looks perfect game day food for sure. 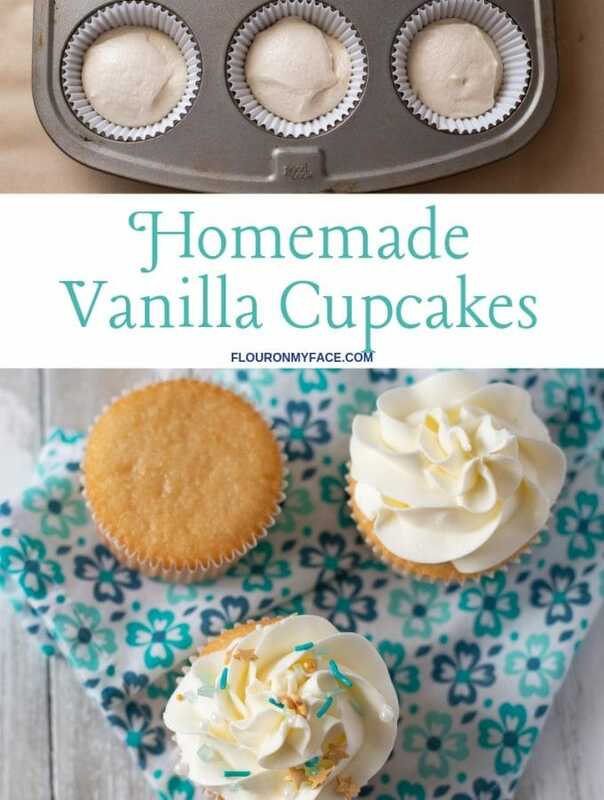 I love such simple and easy recipes that can be done without much fuss. Love peppers so this is my kinda food. 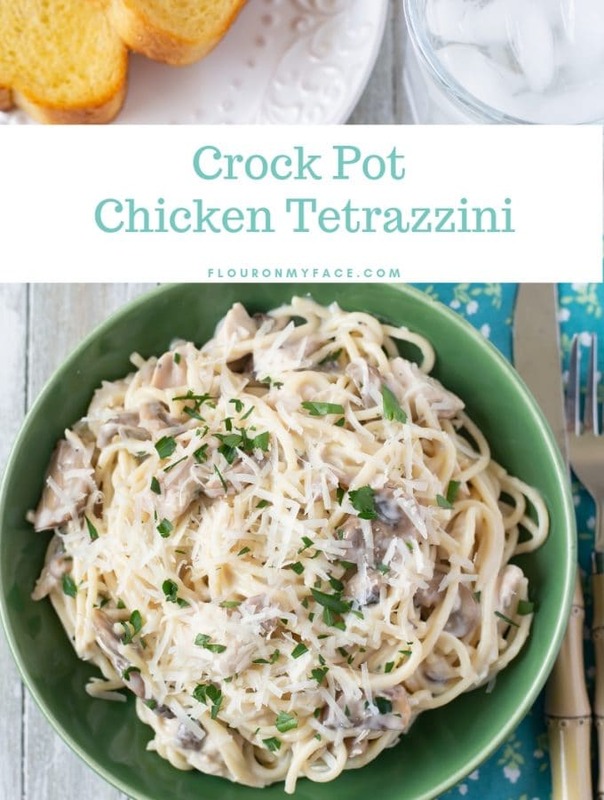 My husband and son would enjoy this recipe too! On a side note, these are our favorite rolls to use. I need to hide them from my kids because they will eat them as a snack and then I’ll have none when it’s time for dinner. Thanks for sharing! 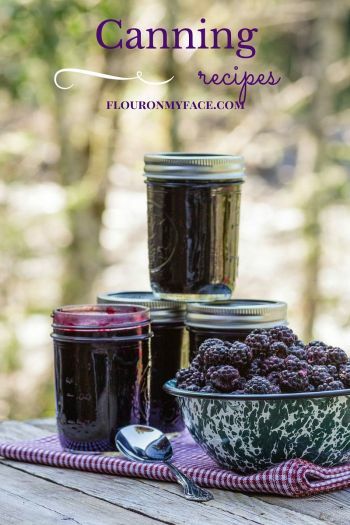 This recipe is definitely a winner!! I bet on Game Day you wouldn’t have a brat or potato roll left. One of my favorite sandwiches is the peppers over brats and the bun is just as important as the Brats and peppers. This is certainly a fun contest. Since I don’t have an Instant Pot or Air Fryer I’m anxious to see the results.